Aakash is planning to study commerce in Raipur. His father has different plans for him. He sends Aakash to an IIT Coaching institute far away from Raipur. Aakash reaches there to discover it’s a whole different world and he is a misfit. Biswa Kalyan Rath’s ‘Laakhon Mein Ek’ is a strong attempt at creating a dark world that suffocates teenagers with their parents’ ambitions. Otherwise known, for his stand-up comedy, Biswa shows that he has much more to offer as an artist through this 6-episode web series. The show stars Ritvik Sahore in the title role. Ours is a society that discriminates on the basis of one’s social and economic class and even though it is not a desirable factor for any progressing society, such is the way we function. In the context of Indian society, one’s social standing is also determined by the institute their kids study in and that is where the monster of IIT steps in. 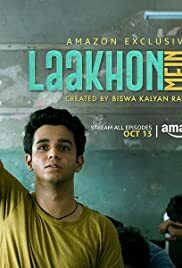 Biswa Kalyan Rath’s ‘Lakhon Mein Ek’ on Amazon Prime Video is a dark commentary on the life of a student whose ambitions are not academic but the family pressure to get into IIT gets to him. The story of the series is around a teenage boy Akash (Ritvik Sahore) from Raipur who is a rather mediocre student. He has no aptitude for science but is under immense pressure from his parents to get into IIT.